Paint is a common home improvement item on the market today which is a potentially hazardous household product. Products become potentially hazardous when they contain chemicals that can endanger human health or the environment if not properly used, stored, and/or disposed. Some paint and paint related products may be in this category. Source reduction is a priority in prevention waste. Buy only the amount of paint needed. Paint disposal may be unnecessary -- apply a second coat, touch up areas which need improvement and attempt to donate "leftover" paint to charity, theater groups and community projects. Disposal is a last resort. The average American home has one to three gallons of unwanted paint stored. When household hazardous waste collection events are held, from 40 to 70 percent of the collected waste is paint. Typically, the paint brought to household hazardous waste collections is 5 to 10 years old. Despite these statistics, funding environmentally safe disposal options for waste paint is sometimes difficult. Paint is made through combining chemical products. These chemicals include solvents, binders, additives and pigments. Paint is classified into two basic categories, latex, in which the major liquid ingredient is water, and solvent-based, which contains some sort of organic solvent. Latex or water-based paints can be identified by words on labels such as "clean with soap and water" "latex", "vinyl", "acrylic" or "water-based". Solvent-based paints may have the words "alkyd", "oil-based", "urethane", "epoxy", "varnish", "clean up with mineral spirits or paint thinner", "contains petroleum distillates", or "combustible: keep away from heat and flame". Recycling and disposal alternatives vary according to these categories and product composition. If you are unsure about the paint composition, read the label and contact the manufacturer for recommendations on disposal. Look for a toll free number on the label. The majority of household paints sold today are water-based latex -- even some enamels. Some people don't know what to do with their leftover paint. The trash collectors may not take it, the landfill may not want it, and it's risky (and possibly illegal) to pour it down the drain. How are you managing your leftover paint and paint related products? Consumers no longer need to buy extra paint thinking they won't be able to match the colors. New color and computer technology allows for more accurate color matching. Machines can read a paint chip sample and match the color. Buy only what is needed and use all the paint purchased. Even though larger quantities may be cheaper per gallon, difficulty with storage and total use or disposal may arise. Measure carefully the area to be painted to estimate the amount needed. Buy the least hazardous product and buy the product for the specific job and materials. Water-based products are becoming more readily available and generally contain fewer flammable and toxic solvents than solvent-based products. Use it up, give it away to friends or donate it to charity. Search out and use leftover paint and paint-related products. Check to see if you or a friend or neighbor already has the product on hand before buying more. Keep an inventory of the kinds and amounts of products you have to help meet others needs. Keep paints tightly sealed in the original can. Close the container tightly after each use. Store in a well-ventilated dry area away from extreme heat, cold or flame sources, pilot lights and out of the reach of children. Keep paint from freezing and away from heat sources. Make sure the lid is secured and store the paint can upside down to create a seal around the lid preserving the paint quality. Some paints can remain useful for 15 or more years. The first choice for many paint and paint-related products, when safe to do so, is to completely use, recycle, or share with someone who can use it completely. Do not discard paint onto the ground or down a drain or storm sewer. Toxic solvents in some products can also pass through the wastewater treatment systems unchanged to be discharged directly into the drainfield or affect wastewater treatment operations. Leftover paint may be used up, shared with neighbors, or donated to a community organization such as a school or a theater as long as it is safe to use and has not been frozen. Before you buy paint, try to use any left-over paint you have. It may be used, if suited to the surface and purpose, as a primer or to paint a storage building area. Latex paint recycling is becoming more common. Recycling programs may include waste paint exchanges and paint re-formulation. Paint exchanges involve giving away paint in good condition in its original container or bulking the paint into drums for reuse. Some older latex paint is not recyclable because it is in poor condition or contains potentially hazardous materials such as mercury (phenyl mercuric acetate) and other heavy metals. Although some state and local agencies have tried to stimulate volunteer paint collection and paint exchange recycling programs, collection may present a problem. Actual reprocessing of leftover paint is also difficult. Manufacturers generally do not have a sure way of knowing the quality of what they are bringing into their factory and may not be able to determine ahead of time if the leftover paint can be used. Contamination, liability, cost, regulations and markets are other problems in paint reprocessing. Under federal regulations, household hazardous waste is specifically exempted from hazardous waste regulations under RCRA. However, potentially hazardous household waste should be handled responsibly. Solvent-based paints require special handling for disposal because they may be flammable and exhibit a hazardous waste characteristic. Most latex paints do not meet the federal definition of a hazardous waste. However, latex paint containing mercury biocides may fail the toxicity test and should be handled responsibly. Interior latex generally has low toxicity; exterior latex may still contain mercury-containing biocides. Any latex may contain mercury-containing biocides if manufactured before 1991. Some states do consider latex paint a hazardous waste. Mercury (phenyl mercuric acetate) has been used as a biocide in paint, but was banned from use in interior latex paint in 1991 and voluntarily withdrawn from exterior latex in 1991. (A biocide generally means any substance that kills or inhibits the growth of microorganisms such as bacteria, molds, fungi, etc.) Mercury-containing biocides are still allowed in exterior latex paints, but manufacturers are working to reduce or eliminate it. Another issue that the paint industry has addressed is lead-based paint. The use of leaded-pigments in paints was banned in 1973. Concern about existing paint-in-place contamination exists. Paints with high levels of heavy metals can be identified by checking the container labels or contacting the manufacturer listed on the label. These paints may need to be treated as potentially hazardous. Lead poisoning through exposure to existing lead based paint-in-place is a public health concern. Consumers can call the National Lead Information Center hotline (1-800-LEAD-FYI) to request information packets regarding lead. The hotline for questions about lead is 1-800-424-LEAD. Consumers can also call the Nebraska Department of Health at (402) 471-2541 or their local health department. The Joint Paint Industry Coordinating Council has published a pamphlet discussing what consumers should do if they suspect their home has lead-based paint. The publication "Dealing with Lead-Based Paint" along with other publications are available through the Paint and Coatings Industry Information Center (202-332-3194). If paint can't be used up, recycled or taken to a household hazardous waste collection, storage or disposal are last resort options. Small quantities of unusable paints (less than half-a-gallon), that have dried and solidified are usually considered a household waste material and are accepted (check first) at most permitted landfills. Contact your area landfill operator or Health Department for information on disposal of the hardened material and if it is accepted. To solidify the paint, allow the liquid to evaporate in an OPEN, secure, sheltered place in a SAFE manner away from flames, children and pets; and then dispose of the hardened material. To dry the paint faster, pour one half inch layers into an absorbent material such as kitty liter or sand to speed up drying. Do not use newspapers or other ignitable materials (especially for solvent-based products) because of the potential for spontaneous combustion. Paint products are not designed to be emptied into storm sewers, household drains (especially if you have a septic tank) or on the ground. If the latex paint cannot be solidified, recycled or taken to a household hazardous waste collection activity or site, some wastewater treatment plants may allow you to discard very small quantities into a sink with plenty of water. Contact your wastewater treatment plant for information. To discard paint pour it down a sink drain and flush with plenty of water. The latex paint discarded in this manner should not contain mercury-containing biocides, lead or other heavy metals. Do not flush paint into a septic system as the impacts of the pigments and other materials are not completely understood. Never dispose of waste paint into a storm sewer. Solvent-based or alkyd paints require special disposal practices. Solvent-based paints are ignitable and present particular hazard. Recycling solvent-based or alkyd is not as common. Some collection/recycling programs bulk solvent-based paint for use as a fuel. If solvent-based paint cannot be used up, recycled or taken to a household hazardous waste collection activity or site, the only other acceptable ways to manage it are to solidify it and dispose of the solid residue at a landfill or store it safely (out of reach of children, tight lid and in a well ventilated area) until a collection activity or opportunity to reuse is available. Contact your area landfill operator for information on whether dried solvent-based paint is accepted. Some areas do not recommend solidification of paints due to concern for air quality and pollution. Give remaining paint to neighbors or community organizations. If it is partially full and cannot be used up or given away, save it for a household hazardous waste collection. Paint thinners, turpentine, mineral spirits and other solvents can be reused. These products, like solvent-based or alkyd paints, should not be emptied into storm sewers, household drains or onto the ground. Reuse or use up these types of products. Recycling and disposal alternatives vary depending on the composition. Read the label or contact the manufacturer for more information about specific products. Methylene Chloride or similar base: use this up or give it to someone who will use it, recycle, or take to a household hazardous waste collection program. If those options are not possible, small quantities of the stripper may be evaporated. The U.S. Consumer Product Safety Commission (CPSC) urges consumers to reduce their cancer risk when working with paint strippers and adhesive removers containing Methylene Chloride, by using the products outdoors or by ventilating the work area. Methylene chloride has been shown to cause cancer in certain laboratory animals. To properly ventilate the work area, open all windows and doors and use a fan to exhaust the air outside. Since 1987, when warning labels were required for household products containing methylene chloride, there has been a 55 percent reduction in the estimated number of cancers to be caused annually in the U.S. from these products. However, CPSC is still concerned about the potential risk to consumers who inhale high levels of fumes when using paint strippers and adhesive removers. Use paint strippers and other products containing methylene chloride outdoors. If a product containing methylene chloride must be used indoors, even in a garage; open all windows and doors and use a fan to exhaust the air outside during application and drying. Lye base -- sodium hydroxide: use up. Small quantities diluted at least 10:1 may be flushed down a drain (not a storm drain or septic tank). BEWARE of Household Solvents: Paint Stripper, Furniture stripper, Turpentine, Charcoal lighter fluid, Drycleaning fluids, Paint thinner, Nail polish remover, Degreasers, Lubricating Oils, and Fuels are generally 100% organic solvent! Solvent-based: use up. Reuse by preparing in the same manner as paint thinner or turpentine. TSP (trisodium phosphate): use up. If using up, recycling, giving away or taking to a household hazardous waste collection are not possible, very small quantities may be evaporated. These solutions are flammable so do not dispose of them in the trash or down the drain. Metal based (such as copper or zinc naphthenate): Use up or save for hazardous waste collection. The human and environmental impact of disposal of these preservatives is not fully understood. Pentachlorophenol (PCP or penta): Do not use. Avoid all exposure. Do not attempt to dispose. If you have some of this product, package it carefully to prevent spills, label clearly and save it for a household hazardous waste collection program. Preservatives containing pentachlorophenol may be contaminated with a form of dioxin, a toxic compound. 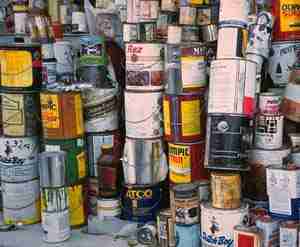 Empty paint cans with a dry film are recyclable in steel can recycling collection programs. Empty aerosol cans can be disposed of with household trash, if aerosol can recycling is not available. For specialty household and hobby paints, handle appropriately as either solvent-based or latex-based paints. Check the label or contact the manufacturer for more information. The paint industry is attempting to address environmental issues such as volatile organic compounds, paint recycling, and toxic metals. The paint industry and government have been working to reduce volatile organic compounds (VOCs). At least one company has introduced a new interior latex paint which does not emit VOCs. New products being introduced in the paint and coatings industry include low-VOC formula paints, more water-based products including stains, sealers, varnishes and other clear coatings, paints made of recycled post-consumer product, and wood cleaners with low VOC levels. There is no completely safe method for "do-it-yourself" removal of lead-based paint, according to the U.S. Consumer Product Safety Commission. Each of the paint-removal methods - sandpaper, scrapers, chemicals, and torches or heat guns - can produce lead fumes or dust. Fumes or dust can become airborne and be inhaled. Further, dust can settle on floors, walls, and tables, and can cause problems. It can be ingested by children from hand-to-mouth contact. It can re-enter the air through cleaning (such as sweeping or vacuuming) or by movements of people throughout the house. Lead-based paint should be removed only by professionals, trained in hazardous material removal, who follow detailed procedures to control and contain lead dust. Lead-based paint may be found on any interior or exterior surface in an older home, particularly on woodwork, doors, and windows. Heavily-leaded paint was used in about two-thirds of homes built before 1940, one-half of homes built from 1940 to 1960, and some homes built after 1960. In 1978, the U.S. Consumer Product Safety Commission lowered the legal lead content in most paint to 0.06% (a trace amount). Lead-based paint is a major source of lead poisoning for children and can also affect adults. Lead poisoning can cause brain damage and can result in impaired mental functions. Lead poisoning in children can result in retarded mental and physical development and reduced attention span. In adults, lead poisoning can cause irritability, poor muscle coordination, nerve damage to the sense organs and nerves controlling the body, and may cause problems with reproduction (such as decreased sperm counts). Lead poisoning may also increase the blood pressure in adults. Retarded fetal development can occur at even low blood lead levels. Thus, unborn children, infants, young children, and adults with high blood pressure have been identified as being most vulnerable to the effects of lead. Consumers themselves cannot tell whether their paint contains lead. Before removing old paint, have the paint checked for lead content. Some local or state health or housing departments can suggest which private labs or public agencies can test your paint for lead or how to obtain a sample for testing. If testing is unavailable or costly, consumers should assume that older painted surfaces contain lead. The room should be sealed from the rest of the house. All furniture, carpets and drapes should be removed. Workers should wear respirators designed to avoid inhaling lead. No eating or drinking should be allowed in the work area. All food and eating utensils should be removed from the room. All cabinets as well as food contact surfaces should be covered and sealed. Children and other occupants (especially infants, pregnant women, and adults with high blood pressure) should be kept out of the house until the job is completed. Clothing worn in the room should be disposed of after working. The work clothing should not be worn in other areas of the house. Debris should be cleaned up using special vacuum cleaners with HEPA (high efficiency particle absorption) filters. A wet mop should be used after vacuuming. Lead-based paint is hazardous to your health. Lead-based paint is a major source of lead poisoning for children and can also affect adults. In children, lead poisoning can cause irreversible brain damage and can impair mental functioning. It can retard mental and physical development and reduce attention span. It can also retard fetal development even at extremely low levels of lead. In adults, it can cause irritability, poor muscle coordination, and nerve damage to the sense organs and nerves controlling the body. Lead poisoning may also cause problems with reproduction (such as a decreased sperm count). It may also increase blood pressure. Thus, young children, fetuses, infants, and adults with high blood pressure are the most vulnerable to the effects of lead. Children should be screened for lead poisoning. In communities where the houses are old and deteriorating, take advantage of available screening programs offered by local health departments and have children checked regularly to see if they are suffering from lead poisoning. Because the early symptoms of lead poisoning are easy to confuse with other illnesses, it is difficult to diagnose lead poisoning without medical testing. Early symptoms may include persistent tiredness, irritability, loss of appetite, stomach discomfort, reduced attention span, insomnia, and constipation. Failure to treat children in the early stages can cause long-term or permanent health damage. The current blood lead level which defines lead poisoning is 10 micrograms of lead per deciliter of blood. However, since poisoning may occur at lower levels than previously thought, various federal agencies are considering whether this level should be lowered further so that lead poisoning prevention programs will have the latest information on testing children for lead poisoning. Consumers can be exposed to lead from paint. Eating paint chips is one way young children are exposed to lead. It is not the most common way that consumers, in general, are exposed to lead. Ingesting and inhaling lead dust that is created as lead-based paint "chalks," chips, or peels from deteriorated surfaces can expose consumers to lead. Walking on small paint chips found on the floor, or opening and closing a painted frame window, can also create lead dust. Other sources of lead include deposits that may be present in homes after years of use of leaded gasoline and from industrial sources like smelting. Consumers can also generate lead dust by sanding lead-based paint or by scraping or heating lead-based paint. Lead dust can settle on floors, walls, and furniture. Under these conditions, children can ingest lead dust from hand-to-mouth con- tact or in food. Settled lead dust can re-enter the air through cleaning, such as sweeping or vacuuming, or by movement of people throughout the house. Older homes may contain lead based paint. Lead was used as a pigment and drying agent in "alkyd" oil based paint. "Latex" water based paints generally have not contained lead. About two-thirds of the homes built before 1940 and one-half of the homes built from 1940 to 1960 contain heavily-leaded paint. Some homes built after 1960 also contain heavily-leaded paint. It may be on any interior or exterior surface, particularly on woodwork, doors, and windows. In 1978, the U.S. Consumer Product Safety Commission lowered the legal maximum lead content in most kinds of paint to 0.06% (a trace amount). Consider having the paint in homes constructed before the 1980s tested for lead before renovating or if the paint or underlying surface is deteriorating. This is particularly important if infants, children, or pregnant women are present. Consumers can have paint tested for lead. There are do-it-yourself kits available. However, the U.S. Consumer Product Safety Commission has not evaluated any of these kits. One home test kit uses sodium sulfide solution. This procedure requires you to place a drop of sodium sulfide solution on a paint chip. The paint chip slowly turns darker if lead is present. There are problems with this test, however. Other metals may cause false positive results, and resins in the paint may prevent the sulfide from causing the paint chip to change color. Thus, the presence of lead may not be correctly indicated. In addition the darkening may be detected only on very light-colored paint. Another in-home test requires a trained professional who can operate the equipment safely. This test uses X-ray fluorescence to determine if the paint contains lead. Although the test can be done in your home, it should be done only by professionals trained by the equipment manufacturer or who have passed a state or local government training course, since the equipment contains radioactive materials. In addition, in some tests, the method has not been reliable. Get sample containers from the lab or use re-sealable plastic bags. Label the containers or bags with the consumer's name and the location in the house from which each paint sample was taken. Several samples should be taken from each affected room (see HUD Guidelines discussed below). Use a sharp knife to cut through the edges of the sample paint. The lab should tell you the size of the sample needed. It will probably be about 2 inches by 2 inches. Lift off the paint with a clean putty knife and put it into the container. Be sure to take a sample of all layers of paint, since only the lower layers may contain lead. Do not include any of the underlying wood, plaster, metal, and brick. Wipe the surface and any paint dust with a wet cloth or paper towel and discard the cloth or towel. The U.S. Department of Housing and Urban Development (HUD) recommends that action to reduce exposure should be taken when the lead in paint is greater than 0.5% by lab testing or greater than 1.0 milligrams per square centimeter by X-ray fluorescence. Action is especially important when paint is deteriorating or when infants, children, or pregnant women are present. Consumers can reduce exposure to lead-based paint. 1. Have the painted item replaced. You can replace a door or other easily removed item if you can do it without creating lead dust. Items that are difficult to remove should be replaced by professionals who will control and contain lead dust. 2. Cover the lead-based paint. You can spray the surface with a sealant or cover it with gypsum wallboard. However, painting over lead-based paint with non-lead paint is not a long-term solution. Even though the lead-based paint may be covered by non-lead paint, the lead-based paint may continue to loosen from the surface below and create lead dust. The new paint may also partially mix with the lead-based paint, and lead dust will be released when the new paint begins to deteriorate. 3. Have the lead-based paint removed. Have professionals trained in removing lead-based paint do this work. Each of the paint-removal methods (sandpaper, scrapers, chemicals, sandblasters, and torches or heat guns) can produce lead fumes or dust. Fumes or dust can become airborne and be inhaled or ingested. Wet methods help reduce the amount of lead dust. Removing moldings, trim, window sills, and other painted surfaces for professional paint stripping outside the home may also create dust. Be sure the professionals contain the lead dust. Wet-wipe all surfaces to remove any dust or paint chips. Wet-clean the area before re-entry. You can remove a small amount of lead-based paint if you can avoid creating any dust. Make sure the surface is less than about one square foot (such as a window sill). Any job larger than about one square foot should be done by professionals. Make sure you can use a wet method (such as a liquid paint stripper). 4. Reduce lead dust exposure. You can periodically wet mop and wipe surfaces and floors with a high phosphorous (at least 5%) cleaning solution. Wear waterproof gloves to prevent skin irritation. Avoid activities that will disturb or damage lead based paint and create dust. This is a preventive measure and is not an alternative to replacement or removal. Professionals are available to remove, replace, or cover lead-based paint. Contact your state and local health departments lead poisoning prevention programs and housing authorities for information about testing labs and contractors who can safely remove lead-based paint. The U.S. Department of Housing and Urban Development (HUD) prepared guidelines for removing lead-based paint which were published in the Federal Register, April 18, 1990, page 1455614614. Ask contractors about their qualifications, experience removing lead-based paint, and plans to follow these guidelines. Consumers should keep children and other occupants (especially infants, pregnant women, and adults with high blood pressure) out of the work area until the job is completed. Consumers should remove all food and eating utensils from the work area. Contractors should remove all furniture, carpets, and drapes and seal the work area from the rest of the house. The contractor also should cover and seal the floor unless lead paint is to be removed from the floor. Contractors should assure that workers wear respirators designed to avoid inhaling lead. Contractors should not allow eating or drinking in the work area. Contractors should cover and seal all cabinets and food contact surfaces. Contractors should dispose of clothing worn in the room after working. Workers should not wear work clothing in other areas of the house. The contractor should launder work clothes separately. Contractors should clean up debris using special vacuum cleaners with HEPA (high efficiency particulate air) filters and should use a wet mop after vacuuming. Contractors should dispose of lead-based paint waste and contaminated materials in accordance with state and local regulations. Government officials and health professionals continue to develop advice about removing lead-based paint. Watch for future publications by government agencies, health departments, and other groups concerned with lead-paint removal and prevention of lead poisoning. Most houses built prior to 1978 have some portion of their houses coated with lead-based paint. White lead was commonly used as a pigment in exterior white paints (and other colored paints) in the U.S. until it was virtually banned in 1978. In addition to its pigment properties lead gave exterior paint durability and a degree of gloss. Prior to World War II lead was commonly used in interior paints as well. Because lead was needed for the war effort, paint manufacturers discontinued lead use in interior paints around 1940 and for the most part did not resume its use in interior paints after the war was over. Lead-based paint caused lead poisoning and elevated blood lead levels in children under the age of six has been a major public health problem for the past half century. It tends to be a problem in low income/minority areas in cities and towns throughout the country. The reasons for this are many. Most importantly low income/minority families live in older dilapidated homes, one of the major risk factors for unacceptably high lead exposures. Childhood lead exposure is typically associated with hand-to-mouth contact with lead-contaminated house dust. Lead dust is associated with lead abraded from window sashes and doors and soil tracked in from the outside. In clapboard-sided houses (even those now covered with aluminum) high lead levels can be found to be associated with soil near the perimeter of the house. Children can be exposed to lead by playing in bare soil within the houses drip line. They can be exposed to lead by sticking soil fragment covered fingers in their mouth and by eating the soil itself (yes some children do love to eat dirt). In many cases exposures occur from lead-contaminated soil being tracked in by children and pets. Having the home inspected for lead is a mixed bag. If it was constructed before 1978, you can assume that the exterior paint has lead in it above the legal limit (1 mg/cm2 or 0.5%) and take appropriate steps to protect your young children (sod over all bare ground, restrict where your children play and pets roam, and vacuum entry-way carpeting often). If you decide to have the house inspected, you should be aware of the legal implications of this action. If testing shows lead levels above the federal guidelines, you are obligated under federal law to disclose all “known” hazards when you sell your home. The availability of such lead inspection results may reduce its resale value. As a consequence, many house buyers do not want to know and therefore do not have their house inspected for lead in paint, soil, or house dust. America’s homes and garages are full of toxic and hazardous products. Paints, pesticides, lye, acids, and solvents are examples of the products that can be dangerous to your family and pollute the environment when they are thrown away. Many of these items are not even needed. This fact sheet has been developed to help you make the switch to safer products and alternatives. Paint is big business. Manufacturers distribute over one billion gallons of paint annually to the tune of $10.7 billion dollars in the United States alone. While most homeowners have one or more cans of paint in their garage, few of them recognize the potential health hazards and environmental toxicity if it is not used, stored and disposed of correctly. Water based paints are considered the safest to use. Paints manufactured before 1990 may, however, contain mercury, which even at low levels of exposure can cause neurological damage without noticeable symptoms. Small percentages of alcohol solvents and glycol ethers are also found in most water based paints. Although the EPA banned the use of lead in oil based paint in 1981, oil based paints still contain toxicants which can be easily inhaled, ingested or absorbed through the skin and into the bloodstream. A few of the chemicals are known carcinogens, others cause nervous system depression, and most have not been adequately tested for their long-term health effects. And, environmentally, the volatile organic compounds (VOCs) found in oil based solvents contribute to photochemical smog. Material Safety Data Sheets are available for paint products and may be helpful in listing the components of the paint and potential health effects. You may request a copy from the retail store where you buy paint. Paints are composed of resins (film formers), diluents (solvents), pigments (color), and additives. The paint products category also includes coatings such as varnish, shellac, polyurethane, and stains. Paints are generally categorized on the basis of the solvent. The two main categories are oil based and water based (latex) paints. Depending on the type of paint selected, other paint related products such as thinners and brush cleaners may be required. Latex and other water based paint products are the safest to use, require no organic solvents, dry quickly, and flow evenly. Solvents are liquids that dissolve other substances and act as carriers for pigments. Useful properties of solvents in paint products are volatility (fast drying), ease of application, even flow and the ability to dissolve paint and grease. Oil based paint solvents pose several immediate and long term health and environmental concerns. While the VOC levels in paint products sold in the United States have been reduced to help control pollution, levels may still be high enough to pose potential health problems. All organic solvents are toxic in varying degrees. It is in fact the useful properties of organic solvents that add to their hazard. Because they are volatile, there is an inhalation risk; or because they can dissolve many things, they can be absorbed through the skin. They may cause as minor a problem as skin rash or, if swallowed, they may be fatal. To reduce the risk to your health, select the least toxic product available for the job. Least Toxic:	Water based (latex). Check that mercury is not included as an additive to prevent mildew. Moderately Toxic:	Many of these ingredients are found in spray paints, paint removers and lacquers. All are highly flammable.methyl alcohol	acetone	isopropyl alcohol ethyl alcohol	ethyl acetate	methyl ethyl ketone. Most Toxic:	The following are known as aromatic or chlorinated hydrocarbons. They can be absorbed through the skin and therefore enter the bloodstream more easily than through inhalation only. Benzene: a carcinogen which causes aplastic anemia (damaged bone marrow), and leukemia, and a probable tetatogen (causes birth defects). Toluene: a probable mutagen (causes inherited changes in gene structure) and teratogen. Methylene Chloride (dichloromethane): a probable carcinogen. Inhalation of vapors increases carbon monoxide levels in blood, reducing oxygen supply to vital organs. Other potential effects include damage to central nervous system or skin burns. It decompresses in the presence of flame or heat into highly toxic phosgene gas. Learn to recognize the warning signs of exposure to organic solvents so that you don’t become a victim of poisoning. Chronic effects from frequent or prolonged exposure to organic solvents have not been thoroughly researched. Increased risk from exposure may cause permanent damage to liver, kidneys, bone marrow, and central nervous system. Our Famous Household Chemical Encyclopedia is one of the most extensive sources of information about household chemicals on the internet today. It has over 100 chapters describing the toxic chemical ingredients in such houshold products as paint, varnish, stains, solvents, or laquers. Household Product Manufacturer Directory with 6,000 household products and 354 household product manufacturer contacts. Specific household product ingredients and MSDS information being added all the time. Our Household Product Safety Guide has tips for the safe use and disposal of household products found throughout your home. Our Guide to Household Solvents will give you more information about those most toxic of airborn chemical pollutants in your home, many in the paints on your walls and the aerosol chemicals we spray in and around our homes. Our Guide to Hazardous Substances will give you more safety information about common household products and the toxic chemicals they contain. Our Asbestos Bible and Asbestos MSDS is an extensive guide to every aspect of asbestos health hazards, exposure risks, abatement resources and tips, answers to common questions, and toxicological information. Our Radon Gas Guide is not to be missed especially if you are a smoker. We all need to have our homes tested for Radon no matter where we live. You're probably breathing this deadly gas into your lungs right now! Question is, how much? Our Radon guide will help you answer that question and many more. Our Benzene Bible with Benzene MSDS is an extensive collection of health and toxicological information about Benzene, including practical answers to common questions about Benzene. Our Formaldehyde Bible with Formaldehyde MSDS will explain the how, where, when, and why of one of the most common volatile organic chemicals contaminating your indoor air. Our Acetone Bible with Acetone MSDS is an extensive source of information about one of the most common organic solvents associated with paint use and disposal. Our Mercury Bible with Mercury MSDS will answer every possible question you could have about one of the most serious public health hazards affecting societies today. Mercury has fungicide properties so was added many paints in the past. Is Mercury in your paint? Is Mercury in your blood stream? ABSOLUTELY! Learn why and the resultant health affects of our body burden of Mercury. Our Lead Bible with Lead MSDS is an extensive guide to Lead which answers every possible question about Lead and why it's also one of the most serious public health hazards affecting children and families today. Lead in water and Lead based paint is of particular concern to children and pregnant women; but it's found in all our bloodstreams, learn why and how to reduce exposure to Lead.